2017 is coming to an end. With the new year and the construction of our Äerdschëff approaching, we would like to propose a redesign of the GP meetings and involve you to a greater extent. Here the trello board previously created by Rodrigo, Nuno and Leo. 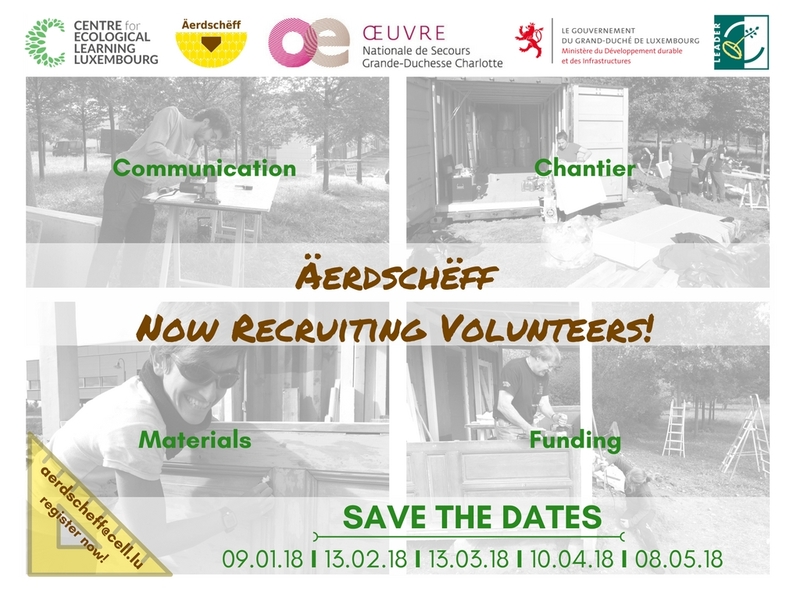 If you enjoy and have some experience organising groups, workshops, if you have some good contacts here in the region and you want to help us, join this group and coordinate with Loic and the Ä team! This working group will be led by Agata with the help of the whole Ä team and will mainly focus on reaching out to the volunteers and communicating with them. The main tasks will be finding the contacts of the different earthship groups around EU and world and involve them in our project. If you enjoy and have some experience in communication and advertising and you want to help us, join this group and coordinate with Agata and the Ä team to advertise our project! This group will be led by Katy with the help of the whole Ä team. The focus of this group will be securing funding and sponsorship, with emphasis on the post-construction time. If you enjoy and you have some experience in writing funding bids (in French and English), or like communicating with a diversity of people, and you want to help us, join this group and coordinate with Katy and the Ä team. If you enjoy and have some experience with power tools and you want to do practical things, join this group and coordinate with Gaia and the rest of the Ä team. Here you can find a google spreadsheet where you can subscribe to you r favourite group, you can also join more than one! The Äerdschëff team would like to thank you for the interest shown during 2017 and your help during this long process. We hope that you will support our project even more in the upcoming year! We would like to wish you an amazing Christmas time and a great start of 2018! Here an interesting article on sustainable architecture. It is all about building houses with simple and cheap material and teach this to people in order to be able to build their own house also in difficult conditions. Read the article to know more about it! Work as part of team and respect other members of staff and volunteers. Respect the human rights of others. Respect nature. We use positive reinforcement rather than criticism, competition or comparison. No discourtesy, rudeness and abusive language towards a staff member, volunteer or visitor, no actual or threatened violence toward or harassment of an individual or group. We don’t litter our waste around CELL’s property or the surroundings. Carry out your tasks with regard to the health and safety of others. We will not tolerate conduct endangering the life, safety, health or wellbeing of others. This means that you should not use of be under the influence of alcohol or illegal drugs during CELL volunteering. Also don’t bring onto our property dangerous or unauthorized materials such as explosives, firearms, weapons or other similar items. Accept and follow directions from the staff members and seek guidance through clarification where you may be uncertain of tasks or requirements. By participating in CELL’s volunteer programme you tacitly agree to abide by the rules described above and declare to hold appropriate and valid qualifications and insurance cover. Please find a PDF version of our Code of Ethics here.